Perhaps no figure has better defined American masculinity than that of the father in the sitcom. For the next three columns I will be examining how fathers and their modes of masculinity were presented during the era known as ‘television’s golden age.’ The television fathers of the 1950s represent the ways in which the institution of fatherhood changed after the hardships of the Great Depression and World War II from the image of dad as solely the provider and voice of authority to dad as provider, mentor, and a loving companion in the home for the children and his spouse. The role of marriage in the 1950s was believed to provide stability and security for the nation and, in turn, ensure the longevity of the nation’s values. Elaine Tyler May documents the importance of marriage and the family during the Cold War era stating that, “from the 1940s to the 1960s Americans married at a higher rate than their European counterparts” (3). The result of these marriages and explosive growth in the population was a shift from urban centers to the suburbs. May also shows how the idea of the nuclear family was used to sell the idea that “the home, seemed to offer a secure, private nest removed from the dangers of the outside world” (1). Thus, the home became the refuge for the family to escape the possible horrors of the Cold War. It provided men with a sanctuary to escape the outside pressures of their working lives and, for many white middle-class Americans, that refuge was found in the safe confines of the suburbs. “Of the 13 million new homes completed between 1948 and 1958, 85 percent were built in the suburbs, so that by 1960 suburbia was home to as many Americans as the central cities” (Osgerby 64). In effect, the suburbs represented the importance of domesticity to the nation’s security and often that security was linked to materialism, consumerism, and conformity. The conformity of the 1950s represented by suburban life impacted definitions and formations of American masculinity as the men of the 1950s found themselves in a world that was less about individualism and more about the greater good of the nation. The suburbs created the space for a new ‘domesticated masculinity’ where dad would play with the kids and barbecue in the backyard during the weekend. As Osgerby notes, “the domestic breadwinner was venerated as a steadfast pillar of the nation’s moral integrity and economic security” because for the nation the “affluent, suburban family was configured as the backbone to American democracy” (68). 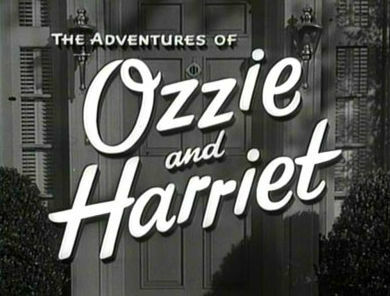 It was amidst these shifts in demographics, social structure and masculinity that America’s longest running sitcom, The Adventures of Ozzie and Harriet (1952-1966) premiered on ABC on Oct. 3, 1952. The series began on radio in 1944 after stars Ozzie Nelson and his wife Harriet Hilliard created their own series following their work on Red Skeleton’s radio show. Ozzie Nelson had been a bandleader during the 1930s and 1940s and Harriet was the band’s lead vocalist. While touring the country, they fell in love and were married. On radio they were sold “as America’s favorite young couple” and they portrayed themselves as a regular American family with kids. For the first five years of the show, child actors played Ozzie and Harriet’s sons, but Ozzie’s actual sons, David and Ricky, later replaced them. The series was popular on radio, but Ozzie recognized that the influence of radio was declining as television became more popular and widely available. Ozzie produced, wrote, and directed a television pilot with his own money to convince network executives that his radio series could make the transition to television. After filming the pilot in order to recoup his investment, Ozzie released the pilot as a feature film in theaters, which helped to build public interest in the series. Ozzie understood that television was a domestic medium that was best suited to stories of average Americans, so in the television series he eliminated the show business aspect of their fictional lives. Ozzie’s occupation is never shown, and their house, a recreation of their real house, was not in Hollywood but instead in the nondescript suburban neighborhood of the fictional all American city of Hillsside. Ozzie’s influence over the series was established from the beginning. He maintained total control over the series; he was the producer, director, and head writer. He also supervised the building of sets, and hired movie cinematographer, William Mellor, to provide the show with a polished, expensive look. Gerard Jones notes, “The Adventures of Ozzie and Harriet was a classy product” (92). Despite the ‘classy look,’ Jones also notes that the series was “one of the most determinedly bland programs ever broadcast” (92). While Jones’s assessment may seem overly harsh, it does call attention to the fact that “bland’ was exactly what the nation sought and needed after the horrors of World War II. As Laura Linder states, “we needed to feel secure about the way our daily lives and our country were heading” and as Americans pursued the American Dream by moving to the suburbs and consuming more products a series like Adventures of Ozzie and Harriet encapsulated those feelings (64). The Nelsons provided a pattern for American families in the suburbs to emulate and for future models of the sitcom family, especially the sitcom dad. The Nelsons showed Americans how the ideal home should look (what modern appliances it should contain), how to interact with neighbors, how to be good citizens, and how to raise children (Linder 64). Though he was unaware of it at the time, what Ozzie was creating was in many ways a “wish fulfillment fantasy that was essentially nostalgic” (93). As Jones notes, “this was the first note of an odd tune that was to run through all the suburban sitcoms of the ’50s” (93). Ozzie’s image of the American family was often without conflict; if conflict occurred it was over the simplest and often silliest situations. Jones states that, “the Nelsons were the thinnest of comedy situations” (93). Yet, it was these ‘thinnest’ situations that allowed the show to succeed because the stories featured little conflict, which in turn allowed the characters to tease and provoke each other into displaying authentic emotions. More often than not the comedy of the series came from Ozzie’s representation of the suburban father as a constant presence. Ozzie’s model of the sitcom dad is someone who, in his attempts to be wise and authoritative, is revealed to be a bit ridiculous. In fact, as Jones points out, Ozzie’s physical demeanor was perfect for portraying this type of father because he was “an endearingly small and vulnerable fellow with crinkling eyes, a hesitant, embarrassed, smile, and a voice that was just fine for chuckling at his own foolishness but always quavered when he tried to yell” (94). Moreover, as the bumbling dad, Ozzie helped other American men “chuckle at their retreat from heroic maleness” (94). Perhaps no episode better showcases Ozzie’s formula for the series and his representation of 1950s masculinity than the episode “Tutti Frutti Ice Cream” (Dec. 11, 1957). In the episode, Ozzie’s dilemma occurs when he gets a craving for tutti frutti ice cream after reading about a little boy in the local newspaper who was rescued by the police and given as much tutti frutti ice cream as he could eat while waiting for his parents to come to the station house and pick him up. Hijinks ensue when Ozzie and his neighbor band together to locate some of the ice cream. Eventually they end up at the local police station where they are giving some tutti frutti ice cream after they get lost trying to find a 24-hour supermarket in a nearby town. Ozzie then enters the room after coming downstairs and tells his son to stop worrying about dessert and tells him to finish his homework. Ricky tells them that he has finished it and then Ozzie gives him a section of the paper and tells him to read it because it will help keep his mind occupied. As Ozzie flips through the paper he finds his own willpower challenged as he asks, “Why is it when you are on a diet that you automatically turn to the ads seeing good things to eat?” The fact that Ozzie spends his evenings with his family close by is illustrative of the model of the 1950s family as close-knit and well mannered. Moreover, the image of Ozzie reading his paper after dinner shows an American masculinity where the man is free to relax even as the wife is still working to maintain order and cleanliness in the home. When Ozzie goes to sleep that night, however his willpower is tested again when he dreams about his youth and the local ice cream parlor where he used to purchase a bowl of ice cream for a dime. Again, the series represents a sense of nostalgia as it depicts Ozzie’s youthful days in the 1920s as carefree and fun. Ozzie is dressed like a college man of the time with a bow tie and striped jacket as he sits across from Harriet who is dressed like a flapper as she sings an upbeat song about lost love with the catchy and innocuous refrain of “goody goody.” The scene plays out as a reminder of Ozzie and Harriet’s youthful romance and showbiz personas and also focuses on the idea that life in America in the past was better, safer, more wholesome and fun. Ozzie wakes from his dream, upset by the fact that even in his dream he cannot quell his craving. He and Harriet then get up, get dressed, and go out late out night to try and find some of the ice cream. They visit a drug store downtown and wake up the pharmacist who sells them a carton of cherry, which they take home and share with their sons. Still, they are all disappointed because the ice cream is not tutti frutti. Ozzie and the family go back to bed unsatisfied. His neighbor, who now also has a craving for the dessert, wakes Ozzie up after Ozzie had earlier woke him up to see if he had any of the ice cream. The men join together to try and quell their craving first by playing cards, then by making a late night snack of hamburgers in Ozzie’s kitchen, and finally by calling the police to see where they purchase their supply of the ice cream. The officer on duty tells Ozzie that they buy their ice cream at the local all night supermarket. The fact that Ozzie and his neighbor can visit an all-night supermarket shows how consumerism was already altering the daily routines of American citizens as they began to rely on a society where shopping and the satisfaction of material desires was possible at any time of the day or night. Lizbeth Cohen notes that, “mass consumption in postwar America created a new landscape” and it was this landscape that the program continually idealized and represented (286). Yet for the show’s comedy to be successful, Ozzie’s quest to find the ice cream of his youth must be complicated, as occurs when they arrive at the supermarket only to learn that they are sold out of tutti frutti ice cream. The owner, trying to ensure customer satisfaction, suggests they go to another market in a nearby town out on the highway (the marker of American progress and the driver of the nation’s new consumer economy). As they drive around trying to find the second market, Ozzie and his neighbor get lost. Ozzie’s neighbor then suggests that they do what the little boy did and seek help from the police because they are lost. Ozzie finally gets his ice cream as he sits in the police station wearing the cop’s hat, eating ice cream with his neighbor and the cop who saved the little boy in the newspaper. In the end, Ozzie is able to find his ice cream and enjoy it with his family, but only after his masculinity is reduced to that of the small boy. As Jones notes about Ozzie’s character in the series, “Ozzie was a big kid” and most importantly “he was the picture of an America that didn’t have to be tough and serious anymore” (94). Ozzie shows American men that they can laugh at themselves, their situations, and even enjoy their families and lives despite the outside pressures of society because American masculinity no longer needed to be defined by stoicism, violence, and gruff behavior. For sixteen years, Ozzie and his family would entertain and, I would argue, inform American viewers about how to live, consume, and enjoy being an American. Ozzie’s model of fatherhood would be celebrated and as Jones states, “Ozzie’s constant presence in the house carried a special poignancy” because for the generation who came of age with television “the eternal nearness of Ozzie was an echo of an earlier, cozier, order” (92-93). It was the need for order and “blandness” that makes Ozzie’s characterization stand out and allows it to still resonate with viewers today. Jones rightly notes that, “the Nelsons created the suburban Neverland of family sitcoms” in each of their sixteen seasons and despite never garnering stellar ratings the series somehow managed to find and maintain a loyal audience who each week tuned in and found enjoyment at laughing at the trivial nature of the American family and its problems and Ozzie’s model of suburban masculinity. Cohen, Lizabeth. A Consumer’s Republic: The Politics of Mass Consumption In Postwar America. New York: Random House, 2003. Jones, Gerard. Honey I’m Home: Sitcoms Selling the American Dream. New York: St. Martins Press, 1992. Linder, Laura. “From Ozzie to Ozzy: The Reassuring Nonevolution of the Sitcom Family” in The Sitcom Reader: America Viewed and Skewed. Ed. Mary M. Dalton and Laura R. Linder. New York: SUNY, 2005. Osgerby, Bill. Playboys in Paradise: Masculinity, Youth, and Leisure Style in Modern America. New York: Berg, 2001.